Mildred “Mickey” Stolzoff was known in Oceanside as a woman who enjoyed physical activity and loved being part of her community. Mickey died Oct. 8 at age 97. 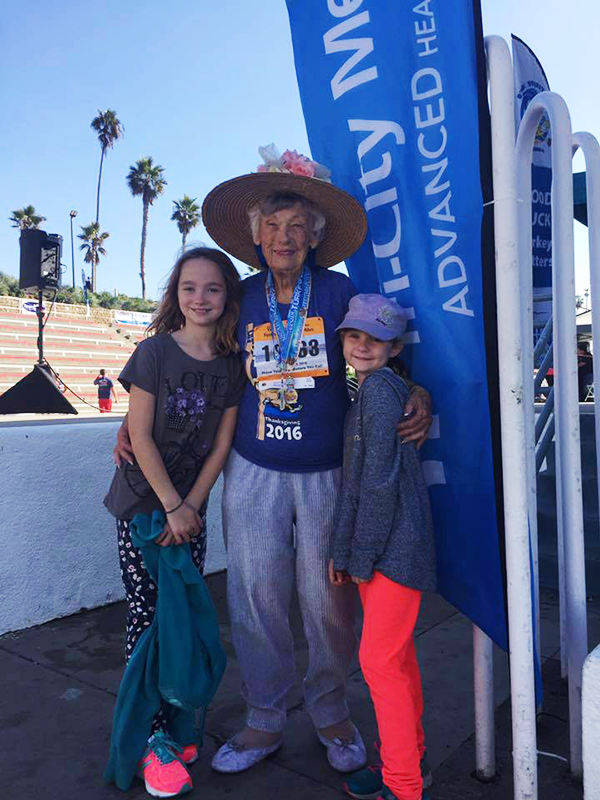 The longtime Oceanside resident raced in six Turkey Trots and the Tri-City Medical Senior Mile in its inaugural year last year, as the oldest runner at age 96. She was an inspiration to other runners. Mickey was also an inspiration to her family, and several of Mickie’s family members and friends will run in her memory as part of Team Mickie at the 12th annual Frontwave Credit Union O’Side Turkey Trot, presented by Tri-City Medical Center. Team Mickie already boasts 28 members, including Mickie’s two daughters, her granddaughters and many cousins and friends. Gascon said Mickey enjoyed talking about wellness and staying fit. Kathy Kinane, founder of the race and director of the Move Your Feet Before You Eat® Foundation, said Mickey stood out among the runners. More than 9,000 runners and walkers from 46 states are expected to participate in the 12th Annual Frontwave Credit Union O’side Turkey Trot and kids run set for Thanksgiving Day, November 23. The event is presented by Tri-City Medical Center and will also feature a Senior 1 Mile on Wed. Nov. 22, for runners 65 and older. The 10k run and 5K run/walk will kick off at 6:55 a.m. and 8:05 a.m. respectively, starting on historic Highway 101 at the Civic Center (located at 330 N. Coast Highway) and finishing on The Strand just south of the iconic Oceanside Pier. A 5K walk begins at 8:45 a.m. All races feature live entertainment along the courses. Runners and walkers can also form family or company teams. More than 50 teams participated in the 2016 event. Entrants can designate part of their entry fees to support local schools and non-profits. The Frontwave Credit Union O’side Turkey Trot has raised more than $270,000 for its participating charities.